One of my favorite things to do is gather up a few friends, zip up my parka, and drive over to Sherbrooke Liquor for some time in their beer fridge. Their walk-in cooler is like a library, with countless bottles of various shapes, sizes, and colors line the shelves. More often than not I will bring home a few large-bottle singles (650ml). Not only are these beers sharable, but you aren’t stuck with five extra beers you may not enjoy. No offence Alley Kat, but I’m really glad your Cringer Cranberry Ginger Ale was a one-time thing. One of the first beers I discovered this way was Erdinger Weissbier. A Weissbier or “Hefeweizen” (a fun word to say) , refer to varieties of beer brewed with 50-60% malted wheat, with malted barley making up the balance. The varieties produced by Erdinger are bottle-fermented, which means the yeast is combined with the unfermented wort just before the bottling process. The live yeast ferments the malt sugars to ethanol and carbon dioxide, producing a mature beer after 3-4 weeks of aging. Darker varieties like Erdinger Dunkel use crystal malt too add body and a touch of caramel sweetness. Bottle-conditioned beers deserve to be served in proper glassware. A German-style weissbier should be served in a tall vase-shaped glass like the one designed by Erdinger. These vessels have the capacity to hold an entire 650ml bottle, and showcase two inches of a meringue-like head. This beautiful head will be ruined if you try and garnish the rim with a lemon or orange wedge, so save your fruit for breakfast. Be sure to leave a finger’s width of beer in the bottle, swirling to re-suspend the yeast before pouring the rest. Otherwise, the flavour of the live yeast will remain in the bottle as sediment, and you will miss out on a world of flavour. With the exception of one or two products (La Bolduc, U Blonde, U Miel, and U Rousse), all beers produced by Unibroue undergo bottle fermentation. 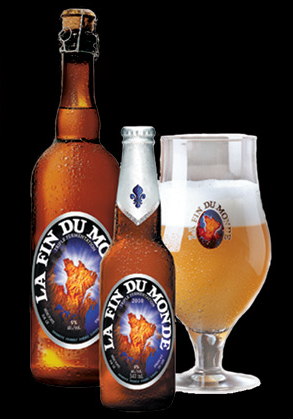 Fin du Monde is a personal favorite, a fruity trippel with notes of spice and coriander, while its lower-alcohol sister Blanche de Chambly is has a similar flavour profile. Weizens are also unique for their use of Torulaspora delbrueckii, a particular yeast variety that produces 4-vinyl-guiacol as a fermentative product. This compound provides the characteristic clove flavour, present in detectable levels (>1ppb) only in German and Belgian-style wheat beers. 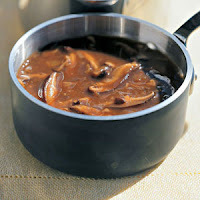 The following recipe makes a tender beef roast with a rich mushroom gravy. The same technique could be used to cook a pork roast with a lighter Weissbier. Combine roast and ale in a pan and marinate 3-4 hours or overnight. Preheat oven to 300°F with rack in middle position. Pat roast dry and rub evenly with salt and freshly ground black pepper, reserving marinade. Heat remaining oil in same dutch oven over high heat and brown roast on all sides. Add shallots, thyme, and ale marinade and bring to a simmer. Cover pot and transfer to oven. Bake until tender (about 2 hours), turning roast over halfway through cooking. Transfer roast to a covered platter, covered and kept warm. Heat 2 tbsp oil in a dutch oven over medium heat. Add shallots, mushrooms and a pinch salt. Sauté until shallots are translucent and caramelized. Remove from heat and set aside. Add juices to pan on stovetop over medium high heat. Whisk in flour and bring to a boil. Season to taste with salt and ground black pepper. Cook 1 minute, stirring nonstop. Remove from heat and keep warm. Let roast rest 10-15 minutes before slicing. Serve over crushed potatoes with warm sauce. Mosher, R. (2009). Tasting Beer: An Insider's Guide to the World's Greatest Drink.